In the future, mobile will become the standard for hosting the customer journey, but most companies today struggle with achieving that vision. That’s the key finding in Altimeter’s latest research report, “The Inevitability of a Mobile-Only Customer Experience.” Over the last five months, my colleague Brian Solis and I have spoken with a host of savvy digital leaders about their mobile strategies. We found that despite the necessity of creating mobile-only journeys for their connected customers, mobile is still grossly underfunded in most organizations. This leaves companies unprepared to meet a “mobile as ‘first screen’” reality and perpetuates mobile’s relegation to just another channel, a technology platform, or a portable version of the web. In turn, customers have no choice but to leave, in search of a better experience. In order for their companies to survive and maintain relevancy, strategists and executives alike must rethink the role of mobile, particularly where and how it can become the primary channel of engagement for a connected consumer. Companies struggle when competing in a tug-of-war between “digital first” and “mobile first” philosophies. Both are important, as customers are becoming more digital and mobile every day. As such, mobile and digital strategies must be developed individually, while also coming together to deliver a unified digital CX. When different groups manage disparate touchpoints, it results in a lack of integration and continuity in the customer journey, forcing customers to view multiple screens between devices and hop channels. This leads to an inconsistent customer experience. Companies focus too much on mobile’s technology, losing sight of what the intended customer experience should be. This causes misinformed investment, often in either reactive mobile optimization efforts or pouring resources into tangential digital channels in an effort to create a consistent cross-channel experience. Mobile is most often positioned as a facet of digital marketing, itself part of a larger marketing division. This buries mobile in slow-moving bureaucracy, unable to nimbly adapt to shifting customer expectations. 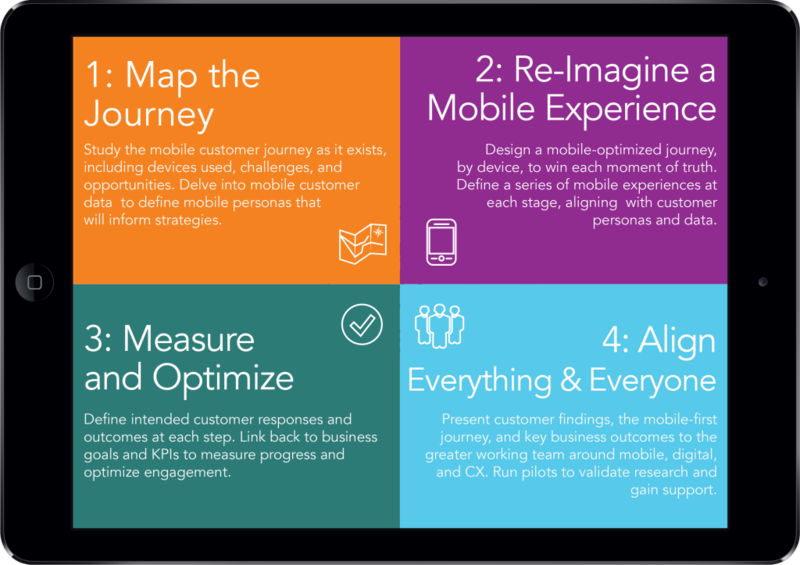 In our research, we found identified four concrete steps that marketing, customer experience, mobile, digital, and IT strategists can take to create mobile-first experiences that align with their customers’ inherently mobile lifestyles. In order to create mobile experiences that meet mounting consumer expectations, strategists must begin by examining the existing customer journey. From there, they move on to architecting the desired mobile experience, continually measuring and optimizing it for success along the way. Finally, internal alignment is achieved once strategists have validated their mobile-first strategies by proving results. I look forward to continuing research around the evolving mobile customer experience landscape throughout 2015 and beyond. Because, if today’s organizations are clamoring to be “mobile-first,” and tomorrow’s goal is “mobile-only,” one can only question what new experience-driven strategies the future holds. The potential for companies to create truly innovative mobile experiences has never been greater nor more exciting.